Located in the heart of the city, InterContinental Dhaka is easily accessible from all key city landmarks such as the Prime Minister's Office, Bangabandhu Sheikh Mujibur Rahaman Medical University, Bashundhara City Shopping Center, the famous Dhaka University Campus and renowned historical monuments. 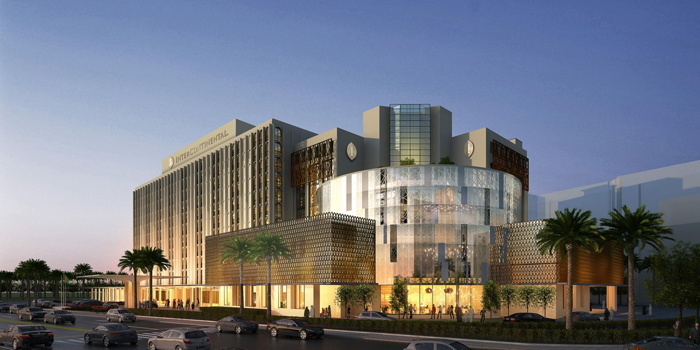 IHG (InterContinental Hotels Group) has announced the opening of InterContinental Dhaka in partnership with Bangladesh Services Limited. The hotel is located on Minto Road with easy access to the downtown business district. Dhaka has witnessed significant economic development in the recent years with a rise in both domestic and international travellers. With opening of InterContinental Dhaka, IHG aims to provide the discerning travellers the best in luxury in its signature style. Located in the heart of the city, InterContinental Dhaka is easily accessible from all key city landmarks such as the Prime Minister's Office, Bangabandhu Sheikh Mujibur Rahaman Medical University, Bashundhara City Shopping Center, the famous Dhaka University Campus and renowned historical monuments. Built in a contemporary design, the hotel offers 226 stylish guest room, including 201 premium or deluxe rooms, 10 deluxe suites, 5 superior suites, 5 diplomatic suites and 5 presidential suites. Guests staying in the Club InterContinental Rooms can access the Club Lounge, to relax, work or enjoy exclusive dining options including breakfast, evening beverages and canapés. InterContinental Dhaka offers 2 exquisitely designed ballrooms and 7 spacious meeting rooms equipped with the latest technology. With over 21000 square feet of specially designed space for meetings and events, the hotel promises flawlessly executed corporate and social events. InterContinental Dhaka features unrivalled facilities and amenities including a temperature-controlled swimming pool overlooking Ramna park, a gymnasium, a steam room, a sauna and a spa offering an extensive menu of signature therapies. The hotel also offers the finest dining options with an array of local and world cuisines including an indulgent all-day dining, a speciality restaurant, a café in the lobby and a pool bar. Guests can also enjoy carefully curated cocktails and canapes at the Club bar and restaurant. The hotel has a dedicated concierge service team that provides attentive and tailored service to ensure that every guest experiences personalized luxury during their stay. Vivek Bhalla, Regional Vice President, SWA, IHG commented: "Today is a milestone occasion for us as we announce the opening of InterContinental Dhaka – a stunning property that will offer the guests a luxurious experience with signature facilities and high standards of service that we have become renowned for. We are confident that the hotel will be a great success and we look forward to welcoming our guests from around the world. The opening also aligns with our strategy to expand our presence across brands, and key cities in the SWA region." Mr. Md Mohibul Haque, Secretary of the Ministry of Civil Aviation and Tourism and Chairman of Bangladesh Services Limited, further stated: "We are delighted to partner with a global hospitality company such as IHG to open InterContinental Dhaka, a landmark hotel in the capital city. Dhaka is emerging as a business hub, attracting travellers from across the globe and we are delighted to offer world-class luxury and comfort to our discerning guests." IHG is currently operating 32 hotels across SWA under the brands InterContinental Hotels & Resorts, Crowne Plaza Hotels & Resorts, Holiday Inn Hotels & Resorts and Holiday Inn Express and is aiming for rapid expansion with a strong pipeline of 60 hotels across cities. If you are a member of InterContinental you may be interested in learning how to optimize your content on our network.